Bigger crops often follow small to medium crops. [The 2018 prune crop looks to be 25-30% off the 2017 crop.] California should expect a larger prune crop in 2019 compared to 2018, weather allowing. While nobody can be certain what the crop will be in ’19, given past history and world production trends, it’s not too early to review production management practices prune growers could use to maximize their income/acre in 2019. Bigger crops generally mean smaller fruit, unless growers manage their cropload, which means thinning with or without pruning. Smaller fruit have less value than large dried fruit and cost more to harvest and dry. Figure 1. 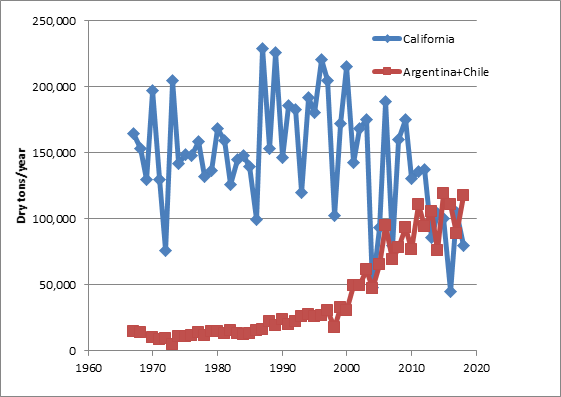 California and Argentia+Chile prune production (dry tons/year) from 1967 to 2018. Data are taken from charts found at http://www.ipaprunes.org. Note that the production in Argentina+Chile has largely stabilized around 100,000 dried tons since 2011, as new plantings have slowed dramatically. Growers in Chile and Argentina average 70-75 ct/pound dry fruit sizes and their costs are lower than those for California growers. Also, in general, prices of prunes from South American are significantly less than for prunes grown in California (see Stock Management presentation from 2018 IPA congress for an example of price differences between producing countries). Finally, major emerging markets that used to consume significant tonnage of small fruit (China, Brazil, and Russia) have dramatically reduced their use of prunes since 2014. The world supply of small fruit is up (more production, less overall consumption) and that generally means lower prices for those categories. To deliver the best possible returns this year, growers may want to consider focusing on producing large – A & B — screen fruit. How? Manage cropload (prune and thin) and avoid early (immature fruit) harvest. Thinning is less expensive than pruning and can be done every year (if needed). Do what you can to harvest when the fruit is mature, not before. Fruit harvested before the fruit reaches maturity (3-4 lbs internal pressure) contains less sugar and dries to a smaller fruit size compared to mature fruit. Consider all possible options to get fruit harvested on time, but not before. Prune buds are not pushing, yet, but now is the time to think about the coming season before the days get filled with doing. Talk with your neighbors and packers to put together a plan for the coming season. Consider attending the local UCCE prune grower meetings (see dates and agendas in this newsletter). Prunes, farmed with the goal of good production of large fruit, should be an important and valuable crop to support diversified growers and the region’s economy in 2019.